As Milan is a tourist hot spot you’ve plenty of hotels to choose from. Check out the DoubleTree Hilton Milan. 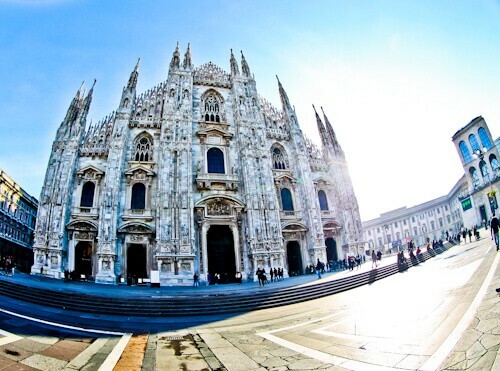 The most identifiable landmark of Milan is Milan Cathedral. It’s known as the Duomo and to take a photo in front of it is one of the most popular things to do in Milan. Construction of the Duomo began in 1386 and took 6 centuries to complete. It’s the largest church in Italy in addition to being the third largest in the world. The architecture is Gothic making the Milan Duomo the largest Gothic cathedral in the world. Maybe it’s the best looking church in the world too? To enter the church you must first buy a ticket. Additionally, you may buy an extra ticket and ascend to the top for a unique view of its spires. The lines to enter the cathedral can be long so I recommend the Milan City Pass to skip the line and save time. Located alongside the Duomo is the Royal Palace of Milan (above right). The Royal Palace of Milan would house Dukes as well as Duchesses before Milan became a part of Italy. Milan used to be part of a country called the Duchy of Milan from 1395 to 1797. 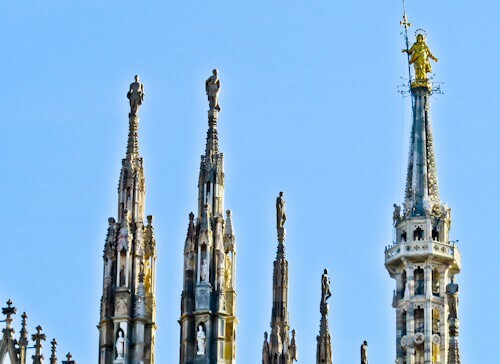 Whilst admiring the Duomo of Milan don’t forget to look to the top. Standing on top of the highest spire is the Madonnina. It’s a golden statue of the Virgin Mary and stands at 108 meters in height. When it was placed here in the late 18th century, the Madonnina was the highest point in Milan. In respect to the Madonnina, no taller buildings were built in Milan. Due to Milan being a growing city a few taller buildings have been built recently. These new taller buildings each have a Madonnina atop of them. In addition, when AC Milan play Inter Milan at the San Siro, this game is nicknamed the Madonnina. This is in respect of the Virgin Mary standing atop the Duomo. 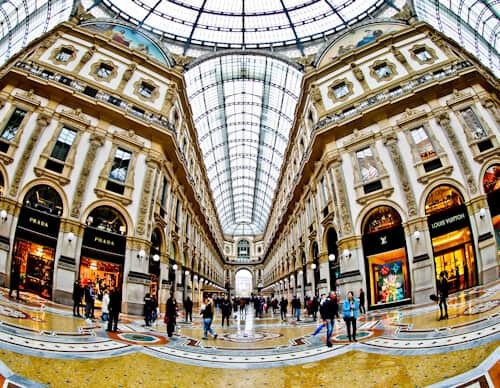 When people talk about things to do in Milan, shopping, or at least a photo in the Galleria Vittorio Emanuele II is high on the list. It’s in fact the oldest shopping mall in Italy as well as being the most majestic, selling top end brands. Additionally, there’s one of Italy’s most exclusive hotels in the shopping mall, TownHouse Galleria. You will probably find Galleria Vittorio Emanuele II full of tourists taking selfies. It’s one of the top Instagram locations in Milan. The gallery is named after the first king of Italy who was born in Turin. 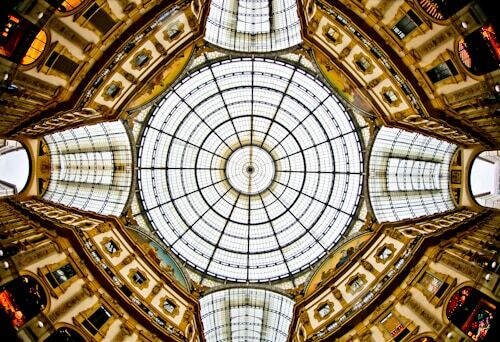 Whilst exploring the Galleria Vittorio Emanuele II, make sure you look up. The glass and iron domed roof is something Gustave Eiffel would be proud of. The roof was designed by Italian, Giuseppe Mengoni. One of the exits leads to the Duomo and another to the Teatro Alla Scala, as a result the Galleria Vittorio Emanuele II is in a prime Milan location. ‘The Last Supper’ painting is located in the Santa Maria delle Grazie. 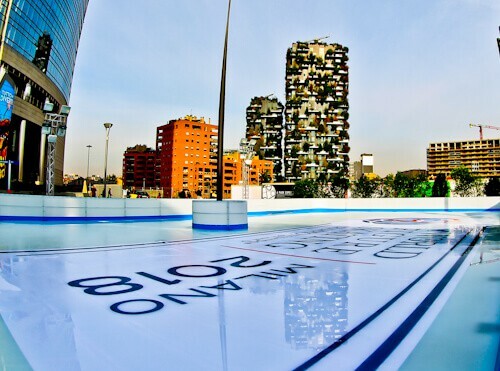 It’s the only UNESCO site in the city, consequently making it one of the top things to do in Milan. It’s a church and Dominican convent built in the 15th century. The architectural style is a mix of Gothic and Renaissance and ‘The Last Supper’ by Leonardo da Vinci is located inside. The church was seriously damaged during World War II but fortunately they heavily sandbagged where the mural was kept ensuring its survival. Today the biggest danger to the painting is people taking photos of it and for preservation reasons it’s forbidden to take photos. You can visit the exact location where ‘The Last Supper’ took place in Jerusalem. For skip the line tickets to top Milan attractions including ‘The Last Supper’, I recommend the Milan City Pass. In addition this pass will gain you entry to Sforza Castle and the Milan Opera House. 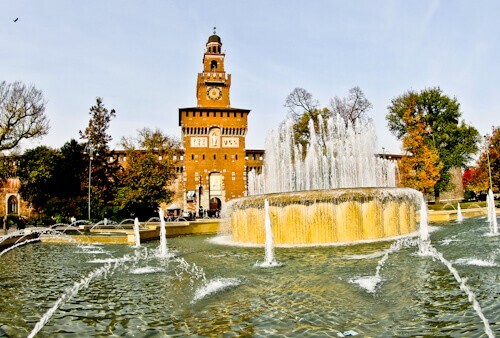 Sforza Castle is named after Francisco Sforza, a former Duke of the Duchy of Milan. The tower in the center is called Filarete Tower and is named after an architect who designed it for Sforza. The Duchy of Milan was controlled by many countries over the years. The French, Swiss, Austrians, Spanish as well as the Venetians have all controlled the Sforza Castle. It used to be one of the largest fortresses in Europe. When you think of things to do in Milan, a huge fortress is the last thing that comes to mind. Today it houses museums and art galleries. Milan Opera House may not look anything special from the outside. On the inside it’s one of the grandest opera houses you will ever see. The best of Italian opera and ballet acts perform here and there are regular live performances. 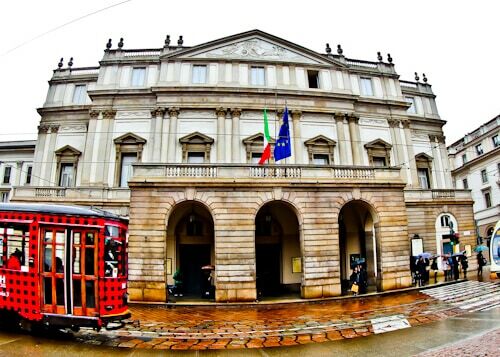 Schedule and prices are displayed on the Milan Opera House website. Italian legends including Andrea Bocelli as well as Luciano Pavarotti have performed at the Milan Opera House. The fact that these 2 legends have performed in this theater makes a visit here one of the top things to do in Milan! Ancient Milan was called Mediolanum and scattered around Milan are several Roman ruins. The best kept ruins are those of Colonne di San Lorenzo (above). Additionally, several columns are located outside of the Basilica of San Lorenzo. 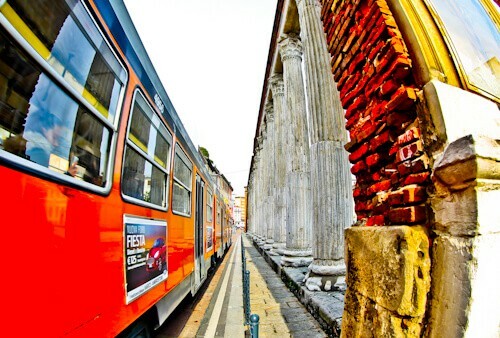 As the colorful trams regularly pass by the columns you can take some beautiful photos. Around central Milan you’ll also find remains of a Roman wall, an imperial palace as well as an amphitheater. Unfortunately not much remains of the Roman amphitheater, nearby Verona is where to go to view a well maintained one, or you could go to Rome to see the most famous amphitheater in the world. One of the lesser known things to do in Milan is visit the canal district. 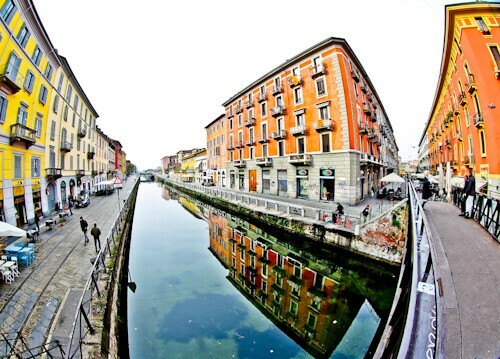 Milan has its own canal district called the Navigli which consists of 5 canals. These canals were used to carry commercial goods and in fact carried the marble required to build the Duomo. Leonardo Da Vinci is famous for ‘The Last Supper’ painting in Milan. In addition, he also designed the canals of Milan. Today, the canals are redundant but offer some wonderful reflection photography opportunities to challenge Venice. You can make good Instagram shots on any of the bridges that cross the canal. The canals are also lined with bars and restaurants making Navigli one of the best nightlife locations in Milan. Additionally, during the summer months you can take a sightseeing canal tour on a boat. The vertical forest (Bosco Verticale) are 2 residential towers with the largest tower rising 111 meters tall. There are over 900 trees on the towers which is why they are named, vertical forest. They are designed to reduce smog and increase oxygen in the city. As you can imagine with all the weight of the trees, the balconies had to be made of reinforced steel. In 2015, the vertical forest won an award for the best tall building in the world. Bosco Verticale are definitely picturesque in addition to being Instagram worthy buildings in Milan. 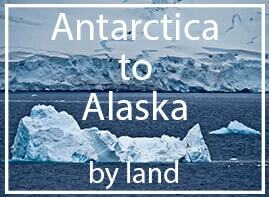 They are conveniently located next to a modern shopping mall. A short metro ride from the center of Milan is the famous San Siro stadium. It’s the largest football stadium in Italy. 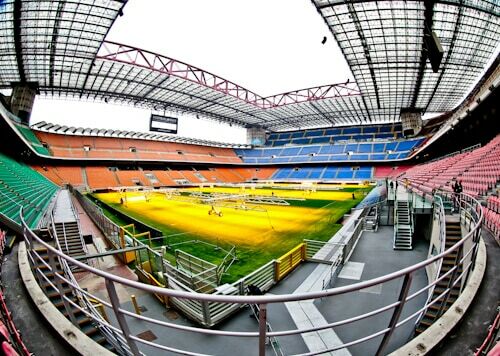 The San Siro is the home stadium for AC Milan as well as Inter Milan. This increases the chances of being able to watch a live football game whilst in Milan. The stadium is open daily for a self guided stadium tour. In addition you can visit the club shop which sells merchandise for both Milan teams, a must for any football fan. 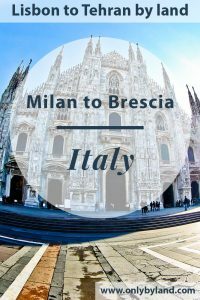 There are regular trains from Milan Centrale to Brescia, the journey takes around 40 minutes and costs less than €9. With such a short journey time you should consider staying in Brescia and visit Milan on a day trip. For the price of a regular hotel in Milan you can stay in a palace in Brescia. We love to follow along on your travels. That’s especially true when you visit cities like Milan! We’re looking forward to the travels towards Iran; that area always intrigues us. Also, nice to know that chances of catching a football match in Milan are good – that would be fun to attend! This is great timing as I am in Milan at the moment. However, I would seriously consider booking a guided tour if you want to visit the cathedral. We queued three hours to get to the rooftops and then it would have been a further two to visit the interior of the cathedral. It truly is an incredible building but that is a joke. Your post has given me some fabulous inspiration for tomorrow though. Hi Anne, yes it’s one of the top things to see in Europe so there are always lots of tourists visiting. I had been to Milan a few years back. And, I instantly fell in love with the city. your pictures of the city, especially the canal district, brought back all my memories. Now my heart is aching to go back. And love the trains there. I have been to Milan a couple of times and I find it such an interesting city. Unfortunately, I have still yet not been able to see the last supper 🙁 I am so glad that you got to see it though and it will definitely be back on my list for next time. Milan Canal District (Navigli) looks pretty, I could see myself getting lost there exploring. Cool fact about Leonardo Da Vinci designing the canals. Loved reading about your recommendations for this city. I am going in a couple months for the second time. Last time I was just there for two days and saw a football match in San Siro which I would recommend everyone to do. Such an amazing experience! Will definitely visit the Navigli canal district! Thanks for that tip! I have been to Milan a couple of times before but that was so long time ago and I was completely interested of other stuff than the history of Milan itself so I am happy to have learn some very interesting facts about the city! Really! Now 20 years older I appreciate more the historical facts. I hope to get back there with a new pair of eyes! It was clever to put Madonnina atop of the newer taller buildings to remain the respect for her. Good recommendations for Milan, my fav city of Italy. Loved the duomo roof. Amazing views from there. I actually had no idea what there was in Milan. I know it only because of the football and fashion. The Duomo cathedral is stunning and I had heard of the Madonnina. I didn’t actually know it was the golden virgin on the cathedral – I just just knew it because of the Milan derby! The Roman ruins there are fascinating – something I only associated with Rome. I’m ready to go to Milan! I did not know about the canals of Milan but they look as interesting as Venice and maybe more so. The architecture of the Galleria Vittorio Emanuele II is quite amazing, the ceilings and those stained glassed windows definitely work. I loved reading this. I am constantly seeing photos of Duomo all over Instagram and it does look stunning – I really would like to visit Milan to photograph it as well. 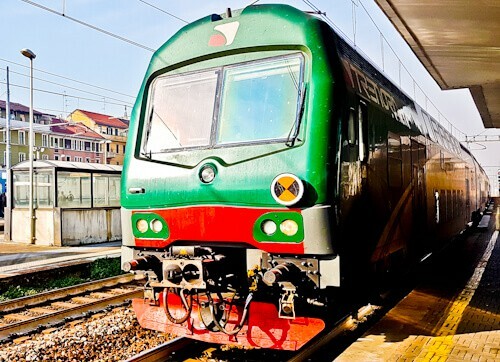 Staying in Brescia, while doing day trips to Milan sounds like a good idea, especially since transportation is budget-friendly. Milan is one of my favourite cities. I’ve been there many times but you have shown me some places I haven’t seen. I love the idea behind the buildings with the trees. I’ll have to do a boat tour next time too. A great tip to stay in Brescia and make Milan a day trip or 2. 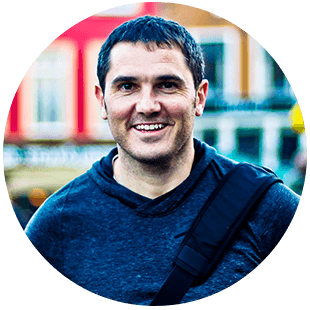 Great pics and info as always James. Hi Alexey, I hope you enjoyed better weather than I did. Although the rain made for good reflection shots!